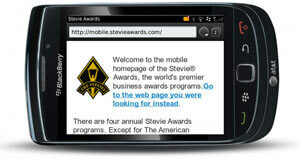 We've pleased to introduce the new mobile homepage for the Stevie Awards, the world's premier business awards. Please try it now – go to www.stevieawards.com on your smartphone. The languages included in the first edition of our new mobile homepage include Arabic, Chinese, French, German, Italian, Japanese, Korean, Portuguese, Russian, and Spanish. We’ll be adding other languages in time. What do you think of our new mobile homepage?